Francesco's i Ios, Hellas: Bestill nå! We are a family run hostel where everybody is made to feel at home and all your needs are catered to. >From the time you arrive to the time you depart you become part of the Francesco's family. There is an air-conditioned terrace bar with satellite television and breakfast cafe which overlooks the port, beach, and one of the best sunset views on the island, as you can see in the photo. All guests are invited for a free welcome drink and a chance to meet fellow travelers in our friendly bar to start their first night on Ios. None of our guests ever pay the cover charge at the famous Blue Note, one of the most popular clubs on the island. There are private double, triple, and quad rooms available for up to 150 people. 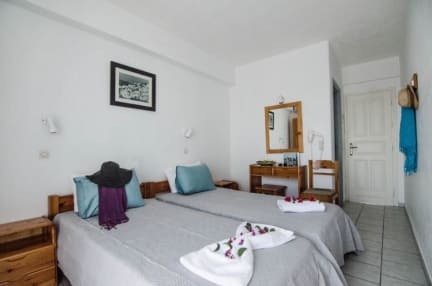 All rooms have been newly renovated. There are also rooms available with shared facilities ( Dorms ). All private rooms have air conditioning and televisions. A number of rooms have private balconies with ocean views. There are also dorm beds available for solo travelers. All rooms are serviced daily as we pride ourselves on how spotlessly clean our accommodation is, we realize what a difference this makes to a guests stay. After you make your booking with us all you have to do is either e - mail or call us with your boat details and our driver will pick you up from the boat free of charge and also drop you off when you are leaving, which is also for free. ( For late night or very early morning ferries we cannot guarantee transfer ) . So don't waste any time guys and girls get booking and we hope to see you during the summer. **PLEASE NOTE : (a.53 l.4389/16) Special Accommodation Tax 0,50€ per night per room ( extra charge ).